Direct Import is amazing. But there are quite a few moving parts, and sometimes they need an adjustment. My financial institution isn't listed. Make sure you select the correct financial institution by checking the URL. Remove the connection and re-link the account(s). 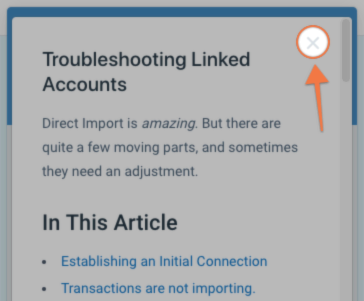 This often gets confused with the Unlink button, which is different. And don't worry, you won't need to remove the account, just the connection! Log in with the primary account holder's credentials. Log in to your institution directly and navigate to your account summary view. Then, try to connect in YNAB. Check YNAB's status page for current widespread issues. Right now, our Direct Import partners are unable to support passwords that contain a pipe “|”, tilde “~”, or angle bracket "< or >". If you update your password to remove those characters, you should be able to connect. If your password is longer than 32 characters, try shortening your password. Are you using a Password Manager? Try entering your log in credentials manually. The default language for your online banking platform must be set to English. There's a lot going on under the hood to get you connected, so issues often clear up on their own within a few hours. If you've already tried removing the connection 👆and still haven't been able to connect for 48 hours, send us a message. We'll work with our Direct Import partner to get you squared away. the full name of the financial institution. the URL you use to log in to their online banking platform. I'm connected, but transactions aren't importing. New transactions will typically become available to import within 24 hours of being cleared by your bank. Things like weekends, holidays, and timing on the bank's end and ours can all contribute to the wait time for transactions. If you're not seeing transactions available to import, make sure you're logged in under the primary account holder's credentials. If you are, and transactions have cleared your bank more than 3 days ago, but are still not importing, send us a message. the name of your financial institution. the name of the account(s) not importing. the dates and amounts of a few recently cleared transactions that haven't imported. There is one exception to the above: Most connections to tracking accounts such as investment and loan accounts will only import a starting balance. Manual adjustments will need to be made after that point to keep your balance up-to-date. If one of your connections has been working just fine, but all of a sudden stopped importing transactions, the first thing to do is log in to your financial institution's website. There might be a roadblock type of alert you need to acknowledge – or their site might be down. Also, check YNAB's status page for current widespread issues. 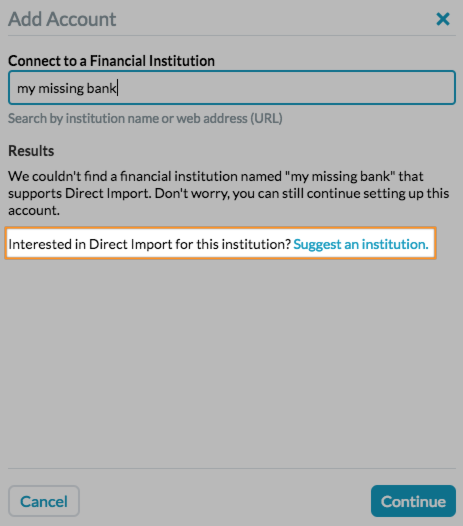 If there isn't an issue on the status page, and you can log in to your financial institution's website and navigate to your accounts just fine, the next step is to remove the bank connection in YNAB and then re-establish it. Once the bank connection is successfully established, you'll need to re-link your account(s) by right-clicking the account name in YNAB and selecting "Link Account". If you still can't connect after 48 hours, send us a message. Be sure to include the name of your bank and the URL for their log in page—and let us know you already tried removing the connection! In effort to provide a more reliable Direct Import experience (and faster customer support! ), we are currently supporting a smaller number of financial institutions than we have in the past. After filling out the form, check out File-Based Import, and of course our mobile apps for easy on-the-go entry! Even with Direct Import, it's a great practice to enter transactions right away, instead of waiting for them to clear the bank and import into YNAB—that way you can always trust your budget! If your connection isn't showing all of your accounts under those login credentials, you'll want to make sure the missing account has been visible on your bank's website for at least two days. If it has, open up a incognito/private window and log in to YNAB again. Then, remove and re-add the connection. This is different than unlinking an individual account, though you will need to re-link them. Don’t worry—you won’t lose any transaction data! The name of the missing account(s), as your bank lists it. The last four digits of the account number, if possible. If you have a gray "x" in the upper right corner, that's your path to Send a Message—which will even give you an option to chat with us if we're available! Otherwise, down below you'll see a link to Contact Us.